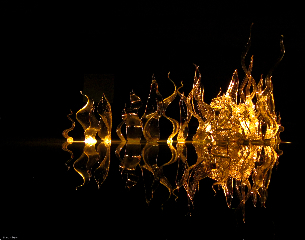 The Museum of Glass opened its doors in 2002 and Tacoma instantly won a place on the international art map. This spectacular, world-class museum grew out of a conversation 10 years earlier between Phil Phibbs, recently retired president of the University of Puget Sound; and Tacoma native, glass visionary, and co-founder of the Pilchuck Glass School, Dale Chihuly. 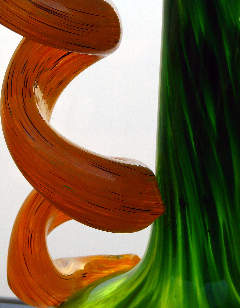 The two agreed that the emergent Studio Glass Movement deserved its own showcase, and that Tacoma should be its nexus. 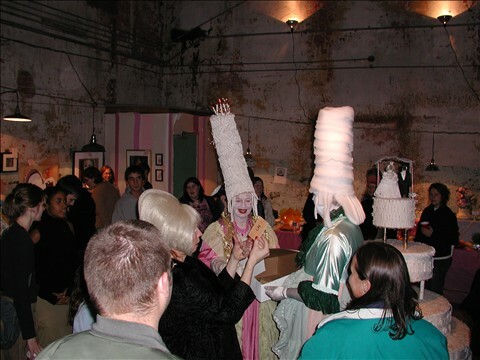 The idea would unfold over the next several years, achieving undreamed of success with its opening in 2002. 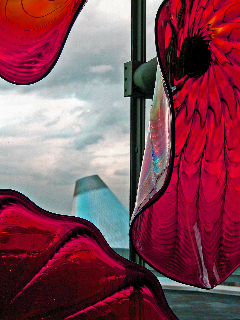 Today, the Museum of Glass forms the most recognizable silhouette on the Tacoma skyline. 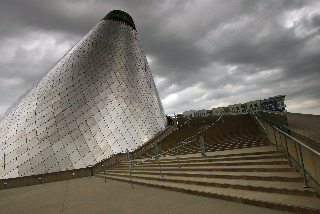 The MoG operates a top-flight learning facility for glass artists, with a Hot Shop Amphitheatre located inside its 90′-high tilted cone. Master glass artists from all over the world teach and exhibit at the MoG, and artists from other mediums are also represented in the galleries. 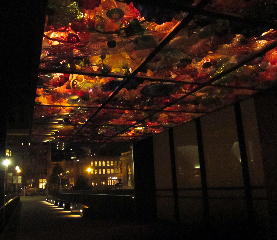 The Chihuly Bridge of Glass, connecting the museum to downtown Pacific Ave., is a tribute to the glass artist who helped make an incredible vision a reality, and elevated Tacoma’s status as an art center. 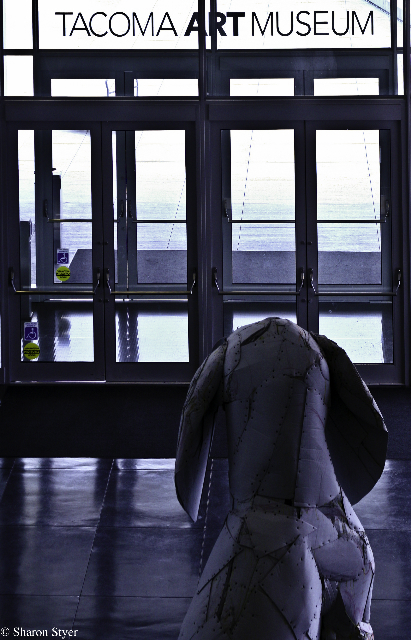 Photographs of the Museum of Glass and art by Sharon Styer. 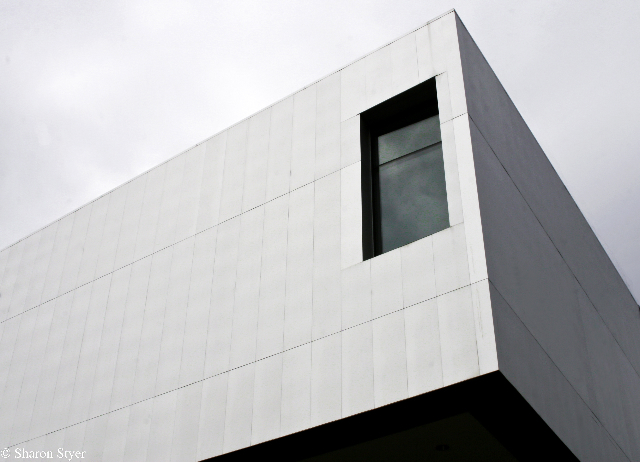 In 2003, the Tacoma Art Museum moved into a sleek new headquarters at 1701 Pacific Ave., and ushered in a new era for the arts locally. The bold structure by Albuquerque, NM-based architect, Antoine Predock, was immediately acclaimed for its modern profile and silvery, stainless steel skin that evoked the luminous quality of Northwest light and water, as well as the city’s industrial underpinnings. The Predock building was the first ever designed specifically to house the museum and its collections since TAM’s inception in 1935; previous locations included the College of Puget Sound (1935-1958), a rented storefront space at 742 Broadway (1958-1963), “the Old Jailhouse,” an office building at 621 Pacific (1963-1971), and a former bank building at 1123 Pacific Ave. The new TAM proved to be a stunning symbol of the arts-fueled, downtown economic revival. Last year, TAM celebrated its 75th anniversary with Mighty Tacoma, an exhibition showcasing the city’s venerable and varied legacy of art and artists. The museum is one of the architectural icons of downtown with 12,000′ of open, airy gallery space, plus sweeping vistas of Mt. Rainier, Thea Foss Waterway and the historic University of Washington-Tacoma campus. The central outdoor courtyard is graced with an undulating “stone wave” surrounded by 30′-high, mirrored glass walls. 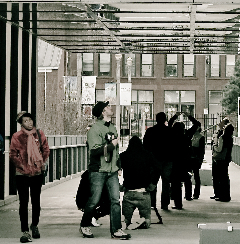 TAM has announced plans for a remodel of its outdoor plaza by Olson Kundig architects, in 2012. The redesign will address issues of foot traffic and connectivity with adjacent properties, including Tollefson Plaza directly across Pacific Ave. The remodel is made possible with support from a 2011 $200,000 “Our Town” grant from the National Endowment for the Arts (NEA) awarded to the museum and the City of Tacoma. Congratulations, TAM, and many happy returns! New Orleans-based poet and National Public Radio commentator Andrei Codrescu headlined the national and regional artists who deconstructed Tacoma history for the event. The idea was the brainstorm of artist Kate Sidwell, a one-time Seattleite whose friend, Jan Gilbert, ran the VESTIGES Project investigating the life of cities through the “tangible traces of things past.” Scattered Ephemera was widely covered in the media and proved an important launchpad for the future of public art in Tacoma. Today, local citizens continue to be engaged by the history, architecture and retro mystique of Woolworth’s, and bring their own scattered, ephemeral memories to the former five-and-dime. Its windows are occupied by installations in the Spaceworks Tacoma program (activating vacant retail space with art); inside is an AT&T switching station. 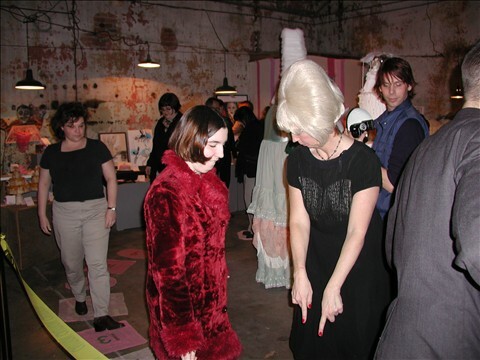 The building is both a relic of the past and a platform for evanescent contemporary art. Move over, Stranger. Make room, Seattle Weekly. 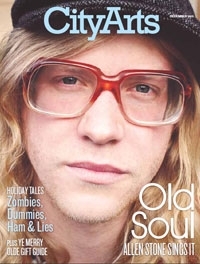 If magazines could talk, that would’ve been the opening shot for City Arts, a 32-page glossy that launched in 2006 and put Tacoma on the cultural map next to our artsy neighbor to the north. The free monthly, under editor-in-chief Jeffrey Hirsch, focused a wide-angle lens on Tacoma’s up-and-coming artists, and on movers and shakers in the realms of music, fashion, technology, exhibitions, arts organizations and the museums. The slick gave the local art scene a surprising new perspective on itself – its rising breadth and quality – served up in full-color magazine photography and smart prose. The creative community found a lively forum for ideas in its pages. According to ancient Chinese tradition, the celestial dragon was symbolic of the emperor and his imperial power. Today, it is a symbol of good fortune for ringing in the New Year, right here in T-town. 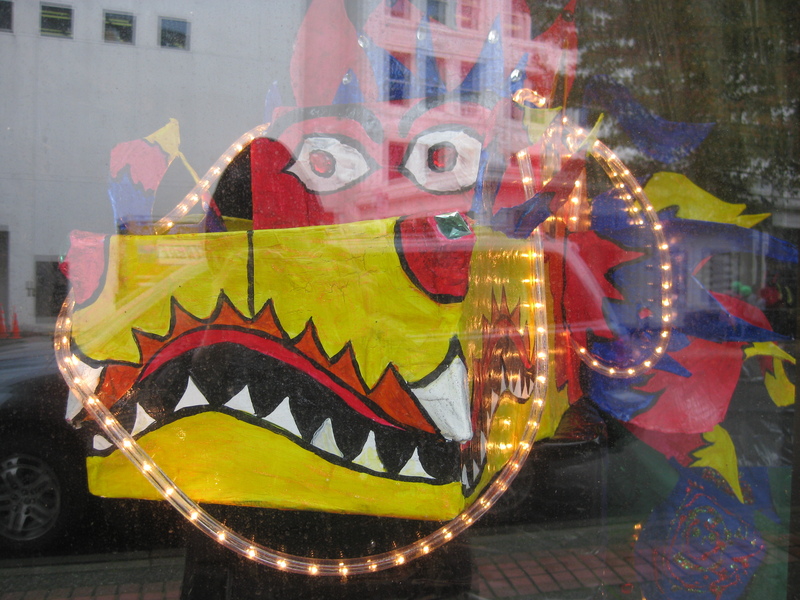 The Tacoma Metro Parks Portland Ave. Community Center organized creative kids from across the city in designing this 35′ Chinese Dragon which will be paraded on Dec. 31 during First Night Tacoma! The creature came to life through the efforts of Community Center members, Sparx units from First Creek and Stewart Middle Schools, and those from Metro Parks, according to Mary Tuttle, Tacoma Metro Parks Senior Arts Coordinator. This year’s First Night Tacoma! event is built around the Chinese Zodiac, and constructing the vibrant creature gave kids a chance to learn about Chinese culture (the dragon signifies good fortune and happiness). It took team member April Shief eight hours to hand-cut 300 scales from cobalt blue and jade green fabric; industrious kids spent two hours a day for two weeks working on the body. The head alone took three days to complete. The traditional mythological creature got a Tacoma twist via a long, boxy body that suggests a locomotive (evoking local railroad history); the blue-and-green scales match Metro Parks’ official colors. You can get a close-up look at the dragon in its lair at 912 Broadway, until Dec. 31, when it will snake down crowded city streets. For more info on First Night events: http://www.firstnighttacoma.org. Toy Boat Theatre’s Final Run Begins Tonight! 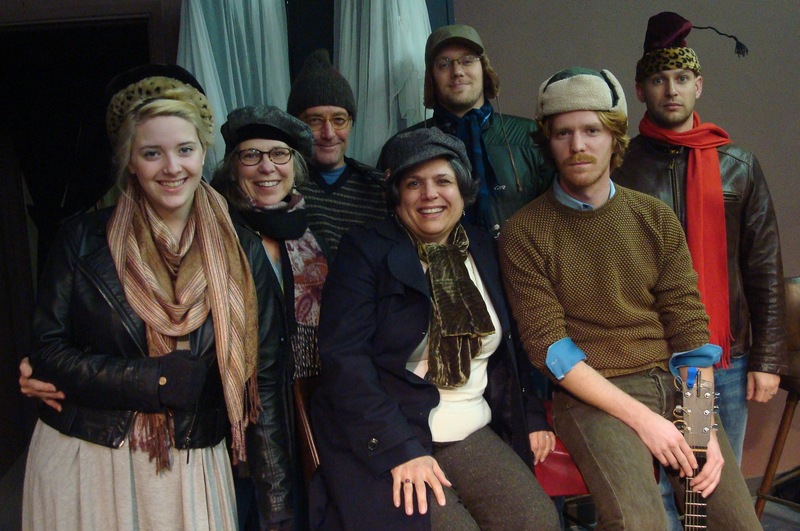 From left: Olivia Seward, Marilyn Bennett, Peter Pendras, Meleesa Wyatt, Matt Shimkus, Trevor Pendras, Aaron Jacobs. One day not long ago, the City called and told me I was a cat. I said, I’m a cat? Amongst other things I Am a Cat! I’m a Catalyst in motion…. Move’n, strive’n, stroll’n, around the Tac! And in the City of Destiny is where I’m at. Haioulanil is indeed a pivotal cat on the local art scene – one deserving of the Tacoma Arts Commission’s coveted accolade in the category of Community Outreach by an Artist. 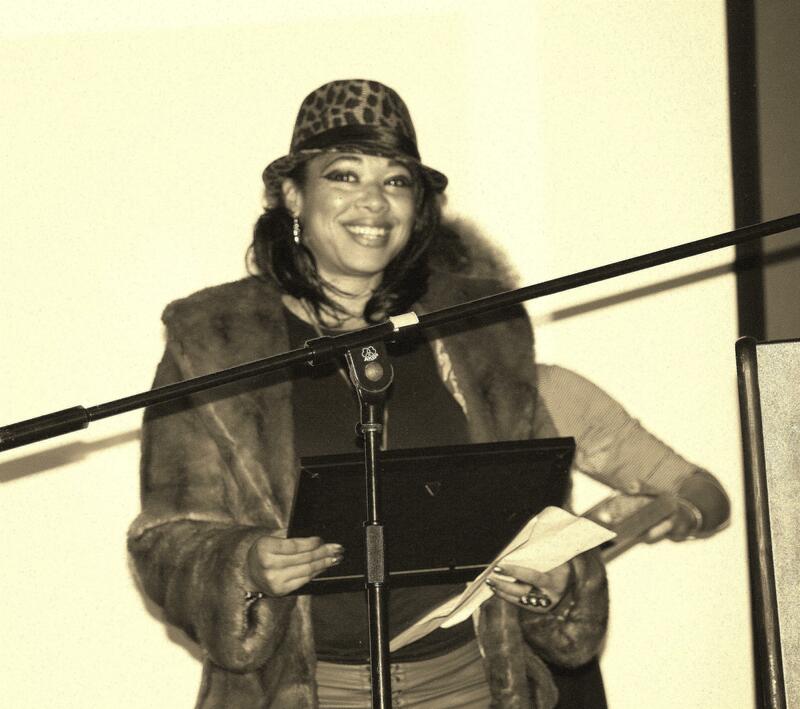 Equipped with a Bachelor of Arts Degree from the Evergreen State College-Tacoma, and two Associate degrees from Tacoma Community College, Haioulanil uses her communication skills to heighten awareness in the areas of community mobilization, conflict resolution and social justice through the medium of cultural enrichment events.